Flip through “Israeli Soul: Easy, Essential, Delicious,” and you’ll see at once that it’s part cookbook and part travel guide, a tour of the land of Israel and the food that native and immigrant Jews have brought to its tables -- its greatest culinary hits. There’s sabich (saa-BEEK), eggplant and eggs in pita; shawarma with lamb shoulder, wrapped in flat sheets of mountain bread; khachapuri, little Georgian oval pizzas filled with cheese and an egg; sesame-studded Jerusalem bagels; yeasted chocolate rugelach; and the famous sufganiyot fritters eaten all over Israel on Hanukkah. You learn the history behind them, get step-by-step photos of how to make them, and see them served at restaurants where they’re the house specialty. This is the third volume for authors Michael Solomonov and Steven Cook, co-owners of several Philadelphia establishments, including Zahav, Rooster Soup Co., and the falafel-focused Goldie spots. The pair traveled all over Israel with photographer Michael Persico, shooting street scenes, restaurants, diners, chefs at work, bakers, kitchens, and lots of food. Most of the finished dishes were photographed in a studio, but whether shot in situ or under lights in a loft, they look delicious. I wanted to pluck one of those Bulgarian beef and lamb kebabs right off the plate, dip a crust of pita into a dish of hummus (“5-Minute Hummus with Quick Tehina Sauce”), and follow it with a piece of kubaneh, a buttery, coiled Yemenite yeast bread that bakes overnight in a low oven and later is served with chile sauce and grated fresh tomatoes. Mike Ran’s Mom’s Coffee Cake goes into a 10-inch springform; you can’t use the common 9-inch size because there’s just too much sour-cream batter. (Ran was part of the Zahav and Rooster kitchen staffs.) It has a ton of leavening and an entire pint of sour cream. That batter is layered and topped with a brown-sugar streusel-like mixture of cinnamon, brown sugar, and chocolate chips. After the maximum oven time given in the recipe, the cake looked baked, a skewer came out clean, and the top was browning, so I pulled it and let it cool. Raw in the middle! But the crunchy topping and rich cake is wonderful at the edges. Almost every town in Israel has its hummus stall (hummusiya), where locals can buy it fresh every day. In this book, the creamy chickpea and tahini spread gets its own chapter. There are recipes for topping it with roasted eggplant and pomegranate seeds, with saffron-braised chicken, with roasted butternut, lima beans and tomatoes, and more. The 5-Minute Hummus with Quick Tehina Sauce involves a technique I’ve never seen before, and I wondered whether it would work. You begin by whirring tahini, lemon juice, garlic, salt, and ground cumin in a food processor. They tell us it will take on the color of peanut butter. It does! With the processor still running you stream in ice water and, as if by magic, the mixture thickens and lightens in color. Add canned chickpeas (not the dried kind you have to soak overnight and boil, my usual method). What results is a revelation: delicious, incredibly smooth, magnificently creamy, and the easiest hummus you’ll ever make. 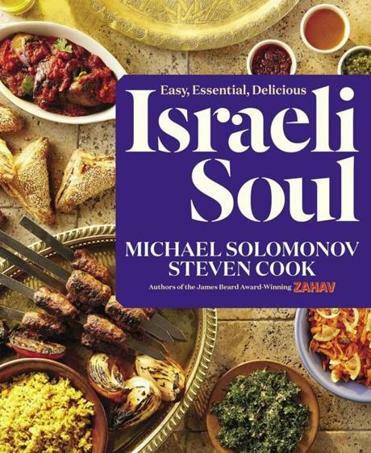 “Israeli Soul: Easy, Essential, Delicious” (A Rux Martin Book, Houghton Mifflin Harcourt, $35).